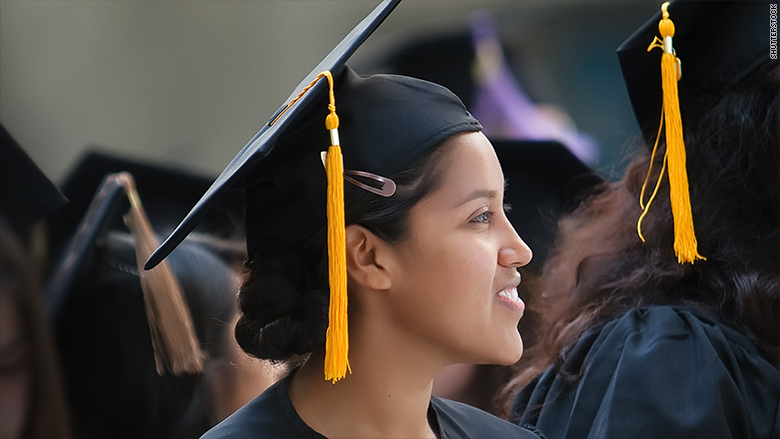 Latinos are growing more optimistic about their financial future even though many are still struggling to get by, a new survey from the Pew Research Center has found. According to the report, 81% of Latinos said they expect their personal finances to improve in the next year. That's up significantly from the 67% that felt that way in 2011 and much more optimistic than the 61% of the general public who said they expect their finances to improve in the upcoming year. But it's Millennials who are the most optimistic, with 90% of Latinos below the age of 30 reporting that they expect their finances to get better in the next year. "This is important because Millennial Latinos make up a large part of the Latino adult population, about 40% -- much larger than the 20% proportion that Millennials make up in the overall U.S. population," said Mark Hugo Lopez, director of Hispanic research at the Pew Research Center and one of the authors of the report. Many of these young Latinos are graduating from college and joining the job market for the first time, he noted. But the optimism among Latinos doesn't exactly reflect the reality, the survey found. 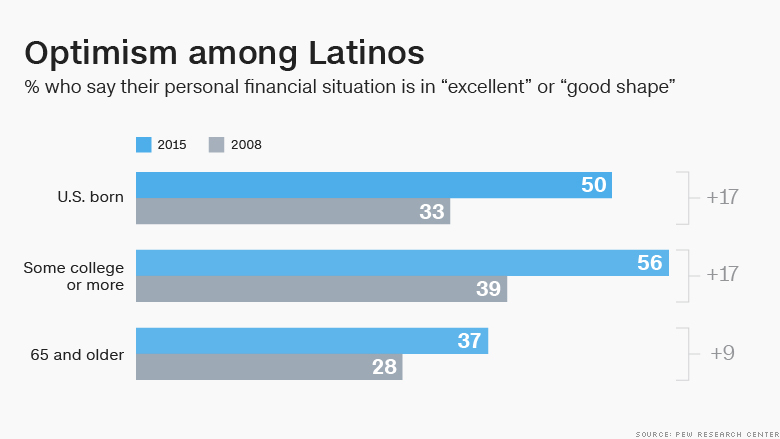 When asked about their current financial state, 40% of Latinos described their personal finances to be in "excellent" or "good shape" -- about in line with the general U.S. population. But another 59% of Latinos described their financial condition as "only fair" or "poor." 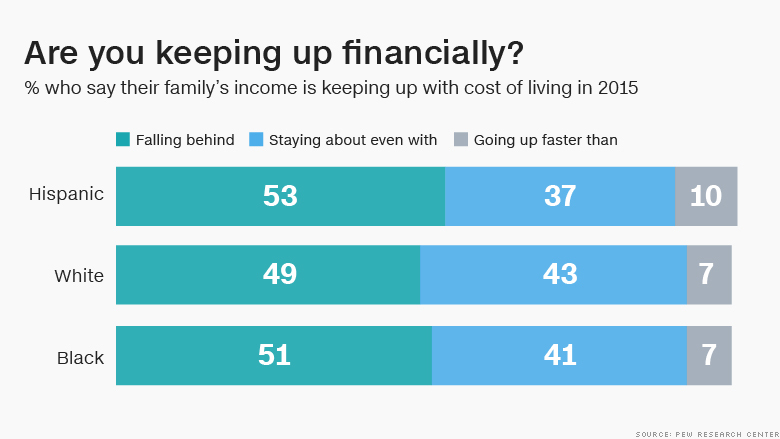 Many Latinos told Pew that they are having a hard time keeping up financially. A little more than half said their family income is not keeping pace with the cost of living in 2015, researchers said. Unemployment also remains higher for Latinos than it did in 2006 -- before the Recession -- although it has fallen from a high of 12.6% in 2010 to 5.6% in early 2016. Meanwhile, median household income for this group has remained essentially unchanged since 2008 at $42,491, compared to $56,866 for white households (which has also remained stagnant), according to the latest Census Bureau data. While there seems to be a disconnect between the financial optimism expressed by the Latino respondents in the survey and their economic reality, Pew's Lopez says that's not really the case. "Many Latinos live in states like California and Texas that have seen job growth," he said. "So, while many formerly unemployed Latinos may be getting jobs... when we look at income, wealth and poverty, Latinos haven't made much progress. They may be getting jobs but they aren't creating wealth," he said. Pew says that 35% of Latinos say today's overall U.S. economic conditions are good or excellent. And Latino's are also optimistic about the prospects for their children's financial future, with 72% expecting their kids to be better off financially than they are. Pew's Lopez says that the recent anti-immigrant political rhetoric may effect the outlook among Latinos going forward. "The issue of the economy and jobs has long been a top issue," Lopez said. "Whether it's true this year has yet to be seen."